Explanation: Deep shadows create dramatic contrasts between light and dark in this high-resolution close-up of the martian surface. Recorded on January 24 by the HiRISE camera onboard the Mars Reconnaissance Orbiter, the scene spans about 1.5 kilometres across a sand dune field in a southern highlands crater. Captured when the Sun was just 5 degrees above the local horizon, only the dune crests are caught in full sunlight. 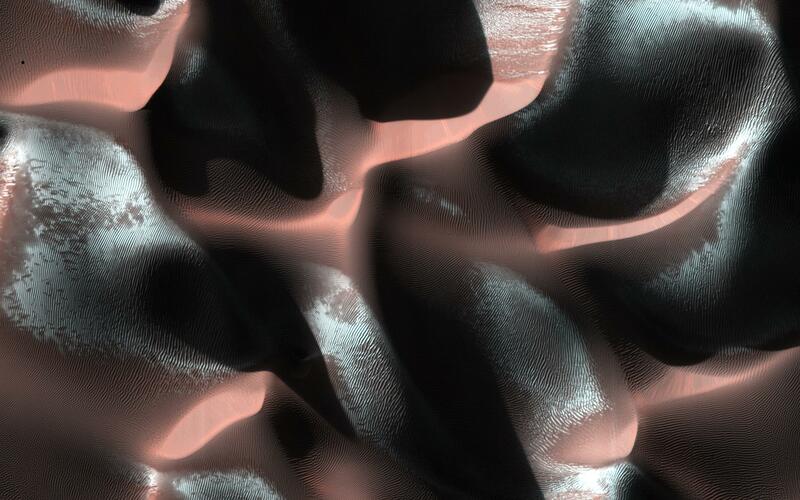 With the long, cold winter approaching the red planet's southern hemisphere, bright ridges of seasonal frost line the martian dunes.